Dastool Dt1701-125 5-Inch Surface Grinding Dust Shroud is designed to contain the dust in your work area when working on concrete grinding. This unit features a flush grinding door which allows dust collection for flush edge grinding. 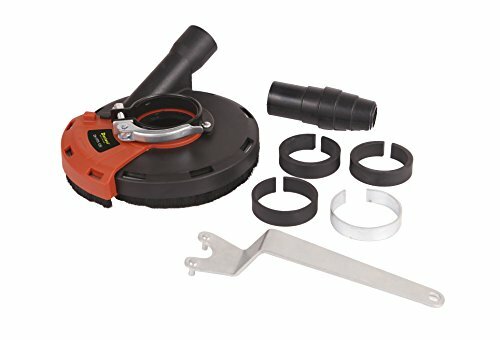 Allows Collection of harmful dust during surface grinding Application attaches directly to 4"/5" all majors brand grinders Locking attachment to vac hose.Using this attachment provides improved productivity when efficient dust collection system is used and helps reduce user exposure to harmful silica dust. Box Contains the following: 1x Dust Shroud，4 PCS clamping washer thickness 1.5-5.5mm,1x shroud wrench,1x Universal Vacuum Cleaner Hose Adapter, 1x User's guide. Can't fitting model: Dewalt model DWE4011;DWE4012. Bosch model GWS13-125CI;GWS13-125CIE;GWS13-125CIX;GWS13-125CIEX;GWS 17-125 INOX;GWS 17-125CI;GWS 17-125CIE;GWS 17-125CIT;GWS17-125 CIT ;GWS 17-125CIX ;GWS 17-125 CIEX;GWS 17-150CI.Porter&Cable 4 1/2".CHICAGO 4 1/2". If you have any questions about this product by Dastool, contact us by completing and submitting the form below. If you are looking for a specif part number, please include it with your message.